In Metropolis - the famous 1927 science fiction film by Fritz Lang, airships criss-cross the skies of a futuristic mega-city. In real-life, unfortunately, they have not been popular since disasters like the Hindenburg and R101 burned unforgettable images of catastrophic failure into our consciousness. However, over the decades, airship technology has improved, and the replacement of inflammable hydrogen with inert helium as the lifting gas has made them very safe forms of transport. The government's former chief scientific adviser, Professor Sir David King gave a presentation at the World Forum on Enterprise and the Environment in Oxford that massive lighter than air vehicles - blimps (non-rigid) or airships (which have a structure) – would replace aircraft as a key part of the global trade network as a way of reducing global warming emissions. In Europe 22% of greenhouse gases are from transport, and the freight-carrying capacity of airships would be able to replace conventional aircraft for most of the slower cargo. With a speed of 125kph (78mph), much lower fuel costs, and a carrying capacity potentially many times that of a Boeing 747, airships could in future carry much of current air freight. A German firm, Zeppelin NT has reentered the airship business with five flying now. Most of the fuel used in conventional heavier-than-air craft is burned up in takeoff, and this does not happen in an airship as the lifting is done by the helium gas and only the forward motion needs engine-power. There are downsides, the bulky craft are slow. Helium is a rare gas, usually coming from finite fossil fuel sources, so it might become scarce and expensive. The biggest problem is that helium is a very small atom, and can leak out from any containment, so airships will need "topping up" with gas regularly. A recent report on mobility by Professor King quoted an estimate by one developer, UK-owned SkyCat, that it could carry twice the weight of strawberries from Spain to the UK of a standard cargo plane, with a 90% reduction in greenhouse gas emissions, much of which is from avoiding the huge fuel burn a jet engine uses to take off. 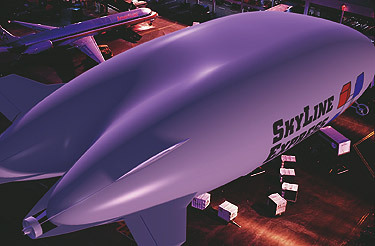 Other benefits included the possibility that airships would not need to use airports if they were fitted with "lifts" to pick up and land cargo. This in turn would reduce the need for trucking goods to and from transport hubs, and allow less well-connected areas, perhaps in inland Africa, to take part in international trade, said King. For the same reasons the blimps could also be used to reach devastated areas in need of humanitarian aid, he said. SkyCat also have a craft on the drawing-board which transports Natural Gas as both a payload, and ingeniously, provides most of the lifting gas - which is pumped out at the destination.